On May 1st 2015, China’s Guangdong Province will implement a new labor law that will increase the minimum wage by 19% and in Guangzhou by 22.2 % (China Daily), making Guangdong the province with the highest paid minimum wage. It is a step being taken partly because Guangdong has found it more and more difficult to attract workers to the province each year. This is in part because wages in other provinces have been rising. Additionally, over the last 7 years, workers have grown more restless, with more than 640 recorded labor unrest cases in the last year alone. Many are wage-related. A condition that many provinces are facing, the need to maintain wage level inflation, is only going to grow more difficult for China’s Eastern provinces as labor elects to stay closer to home. Contributing factors to this ‘stay at home’ attitude are an increasing minimum wage level, that drives higher unemployment, and a movement away from purely wage-related lifestyle choices. With China’s economic growth slowing to sub-8%, and perhaps into the low 7%, many industries are already reporting significant headwinds. Domestic consumption has not taken off as many had hoped, infrastructure investments have come off, and in the wake of the government crackdown on hot money, liquidity is hard to come by. Pair that context to the correlation that minimum wage increases often lead to a period of unemployment1 and one can understand why small to medium-sized firms are growing nervous. Firms that were already operating on thinner margins, were predominantly locked out of financial schemes that the large SOEs and public firms tapped to fund operations. This could lead to an interesting scenario where in the short term the supply of labor will increase, as migrant workers are attracted to higher wages. However, the demand for labor will decrease as small-size enterprises are forced to reduce headcount or stall hiring while they work through the transition. A dynamic that could widen the gap between labor supply and demand. Will this rise in minimum wage help make the city more livable? The data collected from the National Bureau of Statistics, reveals that the growth rate of wages in Guangdong are increasing at a faster pace than CPI. This is something that is rare in the world these days and likely due entirely to government intervention. Over the longer term though, the ability of government to be able to effectively intervene is something that we question. Not just because the increased pressure on firms to pay higher minimum salaries in a challenging economic environment is likely to reduce their competitiveness but also because labor itself has shown that wages are no longer the only issue that concerns migrant labor. Inter-Provincial migration: Since 2008 there has been a noticeable change in both the direction and expectations of this population. This is in large part attributed to the wider economic reforms that the government has been putting in place, which has encouraged investments in central and western regions of the country and created economic opportunities for near-home markets. Migrants are educated: they are able to work on higher value projects and process that support the firm’s own move up the value chain. Migrants are becoming career focused: Fair wages that are paid on time are not the only benefit that is being considered anymore. Personal growth and job security are now equally important. Will this keep Guangdong competitive? In the short term, this is more likely than not to make Guangdong a more attractive place to work, but the concerns over impact to SMEs is something that needs to be balanced. Particularly as they may move operations to another, cheaper, location, as we have seen the garment, textile, toy, shoe, catering and housekeeping industries do in the past. 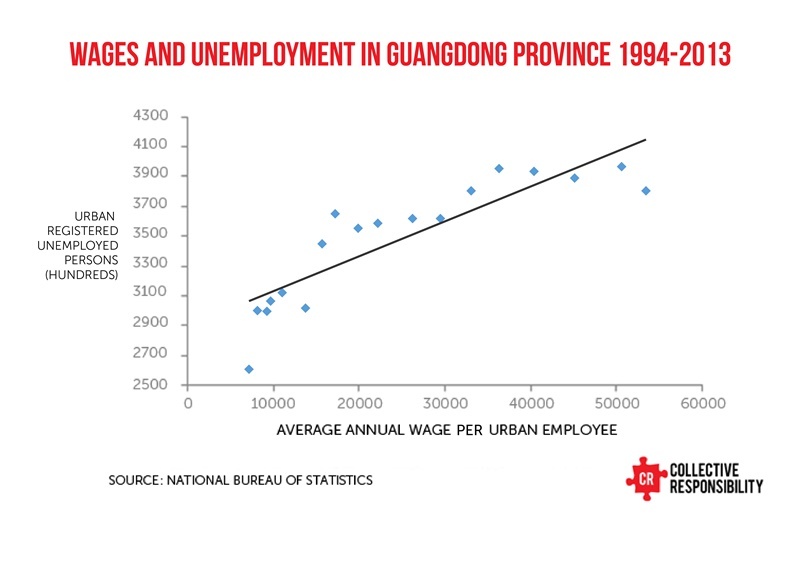 Second to that, for Guangdong to remain competitive long term, it is going to take more than wages. It is going to take a policy level shift in their approach to migration, and begin the development of programs that incentivize firms to increase the productive and intellectual capacity of migrant workers, increase opportunities for education, and create a mechanism that supports the familial needs of those they are hoping to attract. Otherwise, long-term, the migrant labor supply available to Guangdong will simply continue to dwindle as options in other provinces closer to home come online through the job creation that regional economic development provides. 1 Studies done by Institute Study of Labor have shown a 10% increase in minimum wage yields a decrease in employment levels by 1.56% in China from 2004-2007. Tags: career, labor, Migrants, migration, wage.